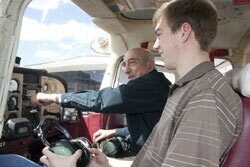 Student Michael Duenkel enjoys getting Private Pilot training from Instructor Leon Sigman. LSA instructor, Jim Wheeler, is well known as one of the best taildragger pilots in the area. The Private Pilot's license has been the traditional entry into flying for many years. It allows flying a wide variety of aircraft almost anywhere in the world. Fly day or night, with friends or family to over 3,000 airports in the US alone. Many people use their planes not only for fun, but for business, too. Within certain FAA guidelines, reimbursement is possible for airplane travel expenses just like car mileage. You don't have to own your own plane, either...almost every airport in the country rents them. If you really "get the bug", you can join a flying club, or partner with a friend to share expenses of ownership. What's more, you don't have to have all your flight training costs up front. You can either "pay as you go", paying for each lesson, one at a time, or take advantage of the special Pilot Flight Training Financing that we offer. The basic Private Pilot license includes a number of different training elements including classroom and book work, flight training with your instructor and solo flight. You don't have to be a "rocket scientist" to figure things out, most aviation education is common sense. And flying is fun for all ages. You might want to begin in high school, or you might be a senior citizen. Men and women of all ages come through our doors. 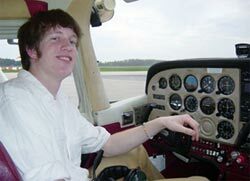 Lakeshore Aviation is proud to be one of only a few flight schools in the area offering Light Sport Pilot training. 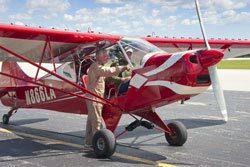 The LSA pilot is authorized to fly lighter two-seat airplanes, and requires about half the time and money to get the rating compared to the Private rating. We train in a Savage Cruiser, a little taildragger airplane, similar to the legendary Piper J-3 Cub. It features tube and fabric construction and a rugged Rotax 100HP engine. Our LSA instructor, Jim Wheeler, is known as one of the best taildragger pilots in the area. All training applies to your private license, should you want to upgrade in the future. Give us a call! Once you have your Private Pilot license, you may find you're limited on certain days by the weather. Obtaining your Instrument Rating makes your pilot's license much more versatile. It allows you to fly with lower cloud ceilings and decreased visibility. If you plan on flying a lot, having your Instrument Rating will make your license useable more often. Lakeshore Aviation is pleased to be one of the few airports in the area offering a Tailwheel aircraft for training and for rent. It is a cute little taildragger airplane, much like the legendary Piper J-3 Cub. It’s called the Savage Cruiser and features tube and fabric construction and a rugged Rotax 100HP engine. It is equipped with radios, a transponder and a GPS. Our instructor, Jim Wheeler, is known as one of the best taildragger pilots in the area. Training is available for your Tailwheel endorsement if you’re already flying, or Light Sport training if you’re not. Once approved, you can rent the plane and go out and have fun! Due to cold weather, the Savage is not available during the winter months. Lakeshore Aviation is proud to be the only Seaplane flight instruction school in Wisconsin and Illinois listed by the Seaplane Pilots Association. 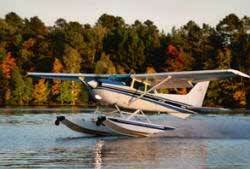 We offer training in our 1979 Cessna 172XP (210HP) on Wipline 2350 Amphibious floats. The airplane is full IFR featuring a Garmin 430 GPS and autopilot. If you don't have them already, training in this airplane will also qualify you for the FAA High Performance and Complex endorsements. Instrument proficiency checks are also available. The seaplane is available from April to October each year. Special arrangements can be made to meet your schedule. Some folks get the rating just for the fun of it, or to get their Biennial Flight Review (BFR) completed. Instruction consists of mostly water operations: normal, glassy water, rough water and confined-space take-offs and landings, step taxi and turns, slow taxi, docking, mooring and beaching, surveying landing sites, securing the aircraft, and effects of wind on the plane. In the air, particular emphasis is put on slow flight, steep turns and stalls. Most current pilots take 8-10 hours to complete the rating. The checkride is per the current FAA PTS, and consists of an oral and flight exam. There is no written exam required. The current floatplane rental rate is $205/hour plus instructor. Due to fluctuating fuel markets, a fuel surcharge may apply. A flat $100 ground school fee also applies to cover all ground training, handouts and pre-checkride oral review. Examiner fee is extra. We also carry a nice inventory of seaplane-related training materials and books. Contact us for more information. Sorry, due to insurance limitations, solo rental is not available at this time. For complete information about seaplane training requirements, visit www.seaplaneflying.com. Lakeshore Aviation can assist you with all your seaplane needs. Training is available at either our home FBO location in Manitowoc, WI, along the Lake Michigan shoreline, or at our owner's seaplane base in northern Wisconsin, surrounded by thousands of lakes. A newly remodeled guest cabin is available for rent; bring the family and make it a vacation! Training is also available during EAA Oshkosh AirVenture, only a short distance away. International students will want to know that our home base is located only three hours (by car) north of Chicago O'Hare (ORD) airport. Email us to arrange training for your next trip to the US and to review FAA and TSA license verification requirements for non-US citizens. Lakeshore Aviation offers complex and multiengine training in a variety of aircraft. Please contact our Chief Pilot, Curt Drumm, for additional information. Obtaining your Commercial Pilot Rating is your entry to the world of professional aviation. If you plan on making flying part of your career, this rating is a must. Even if you're not looking to fly for a living, getting your Commercial Rating demonstrates dedication to excellence to your peers, your family, your employer and your insurance carrier. If you're interested in getting your multi-engine license, commercial is a good choice, too, and will help with insurance requirements. There are a specified minimum number of flight training hours required for Commercial, as well as an upgraded medical certificate, written and practical flight exams. Please click on “Requirements” for details. One of the most exciting and challenging parts of flying is teaching others. 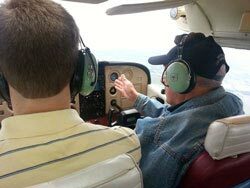 If you have the desire to share your love of flying and the ability to accurately describe and teach it to others, becoming a CFI (Certified Flight Instructor) may be for you. Additional ratings beyond CFI are also available, including Multi-Engine Instructor and Instrument Instructor. Call us for details. Our programs will take you through all the necessary steps to get your CFI rating. Our experienced instructors have been through it before, and they know what it takes. If you're ready for the challenge, give us a call.